Pancakes or omelettes? Or something even better? Medieval fantasy tropes are enjoying a pop-culture moment these days. 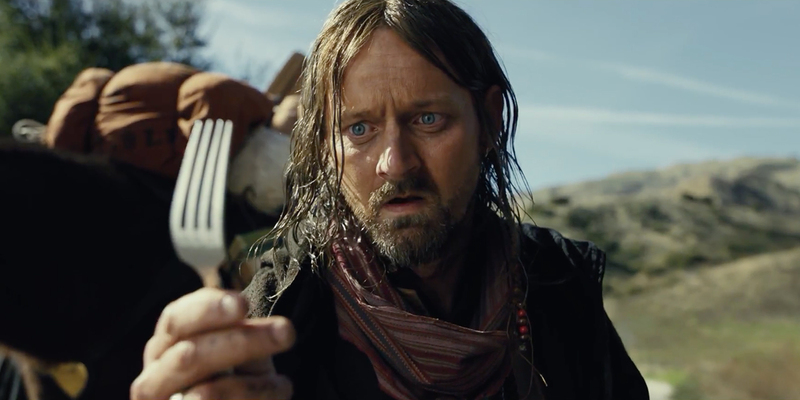 IHOP is the latest to jump on the bandwagon, with a humorous commercial about a neurotic wanderer and his horse. The dilemma quickly causes him to spin out—until the camera cuts back to reveal the oddball isn’t in Middle-earth after all, but really, somewhere in suburbia. It’s a willfully absurd conceit, an appropriate followup to the airplane pilots who can’t stop saying “pancakes” in the agency’s first work for the brand, which launched last month. It also can’t but evoke the Bud Light “Dilly Dilly” campaign, though both are riding the wave of general Dungeons & Dragons style enthusiasm spawned by Game of Thrones. The main character does, in fact, seem eccentric and motivated for both pancakes and omelettes, so in that respect, the ad—directed by David Shafei through production company World War Seven—seems to have succeeded, even if it feels a bit forced. The wanderer tries to throw the helpful stranger a bag of something for his “trouble.” Presumably it’s not as valuable as actual gold. But like all good comedy, the spot saves the best bit for last. “Don’t leave that horse,” says the local homeowner, futilely, as the wanderer beelines for breakfast, abandoning his ride in the middle of the road, along with the fork.